Now here we are, not that many years into the future from when that cartoon once aired and we’re reading news stories about vibrating tattoo applications for our cell phones and computerized shopping carts that are being created to make shopping a totally self-sufficient process. Therefore, when we read about a man who is ninety-five percent blind driving himself to the dry cleaners and Taco Bell, all without the assistance of another human being, we probably shouldn’t be surprised. Still, it’s a pretty safe bet that most of us are. From Google Plus to Google Googles, Google has definitely branched out far beyond being a popular search engine. Perhaps their proudest invention to date has been their self-driving car. The automobile that made its initial premiere in 2010 has been defined by Google as being both safer and more efficient. There are probably a lot of skeptics out there wondering if the “safer” part is true. After all, there are a lot of hazards and accidents that happen when we are in control of our vehicles and so who’s to say that they can be avoided with computerized reflexes? We can’t even text while driving. Can we really drive without driving? Yet, as of this past Wednesday (March 28), this modified version of a Toyota Prius did provide a least a little proof of their claim. 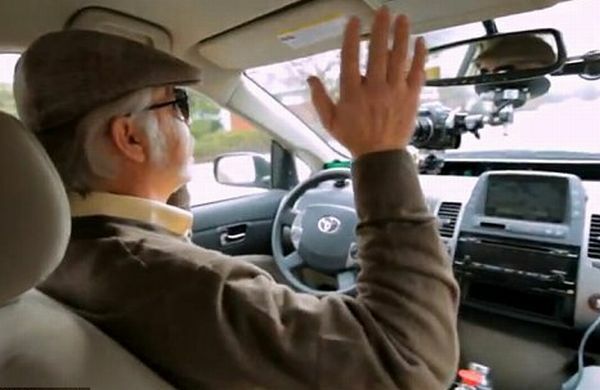 Steve Mahan, the legally blind man who sat behind the wheel, at least on the YouTube that features him driving around, he appeared to be both calm and elated when it came to his time out on the road. While viewing his excursion, it was an experience almost reminiscent of when a teenager goes out on their own for the first time. Mahan stated himself that he believes that it will provide him with both the independence and flexibility that he longs for as a man who is fully capable in every way but when it comes to his sight. Although all reports indicate that it will still be some years before self-driving cars are in mass production and on car dealership sales floors, there are already states that are prepping for what appears to be an inevitable transition. Last February, Nevada was in the news for becoming the first state to implement legislation surrounding the requirements needed to put a self-driving vehicle on state roads. And while Google stated that Mahan’s excursion was more of a successful experiment more than anything else, in many ways, Google’s reputation has definitely been for “saying it and doing it”. Plus, with the price of gas on the continual incline, the more that this car is promoted as being one of the best gas mileage cars around, the demand for it may end up accelerating its production time. And driving oneself will be a thing of the past. Sooner than later within our future. What a wonderful idea that has come into fruition. When the cars are mass produced this will give freedom to many people. I am not sure I am ready for this in my lifetime. So many things could go wrong mechanically. But if it is our future…then it is our future. This story touches me. My mom was legally blind and was never able to drive. She was a very independent person. I know she would have loved the freedom to not have to rely on public transportation and the kindness of others to get around. I can imagine the joy this man felt…I trust there will be many more years of testing and the proper laws put into place before this becomes a reality, but I’m sure there are many visually impaired people that are excited to think there is a chance this could become a reality. I’m scared to even use the cruise control on my car. 🙂 But I do think this provides a great opportunity to those who otherwise are not able to drive.